Procrastination never tasted so good. What a wonderful soup. This was a great combination between the Thai coconut soup Tom Kha Gai and pho. I really enjoyed this soup and it will definitely become a staple. The broth is made with chicken broth, cilantro stems, anise, coriander, white peppercorns, chili and coconut milk. I was surprised how delicate the coconut flavor was and how everything blended together seamlessly. Finally. Finally I made this dish! This is my favorite dish at Al Di La. I usually make a point of eating at Al Di La when I am visiting friends back in Park Slope, Brooklyn. This Italian trattoria famously does not take reservations, but it's worth the wait (or the ridiculously early dinner). While I no longer live close enough to get my casunziei fix, I have doctored up a version very close to the one at Al Di La. This dish is perfect for fall. I didn't follow a particular recipe for this dish -- you can just wing it. Below are the ingredients and proportions I used for the filling and the sauce. You can use any fresh pasta dough recipe for the raviolis. Pasta dough recipes vary in the amount of eggs, flour and oil -- but I am partial to the one by Mario Batali in Food and Wine. I cannot emphasize enough how important very farm fresh eggs are for a great pasta dough. I made a half recipe of the pasta dough recipe and ended up with about 30 small raviolis. Place whole beets in a baking dish with 2 TB of water, cover with foil, cut a slit on top and bake for 45 minutes. Once beets are cooled, use a pairing knife to peel and segment the beets. Place beets into food processor and pulse until the beets form a smooth puree - there will be some texture left. In a large bowl, add the beet puree and ricotta cheese. Salt and pepper filling to taste, and then mix in one egg. Refrigerate the filling until ready to use. Make the pasta dough according to your favorite recipe. Roll dough thin for raviolis (I used #6 on the pasta maker). Cut the shape of your ravioli and fill with the beet mixture. Seal the edges with egg white. I used a 3 inch biscuit cutter, which made fairly small ravioli when folded over into semi-circles. If the dough was rolled a bit thicker (#5) it could handle a larger size and more filling. For the sauce, in a frying pan place the butter and whole sage leaves on low heat until the butter is fully melted and slightly browned. Gently drop the raviolis into a large pot of salted boiling water. Remove the raviolis when they float to the top -- should only take 2-3 minutes. Drizzle the butter sauce over the raviolis and then add a healthy amount of poppy seeds. Note: If you're feeling ambitious and make extra, you can make the raviolis and freeze them on a large baking sheet dusted with cornmeal. Once frozen through, you can remove them from the sheet and into a plastic freezer bag. 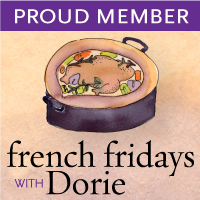 I joined the online cooking club, French Fridays with Dorie (FFWD). We are cooking our way through Around my French Table by Dorie Greenspan. I am really excited about the book and the club - I love cooking homework and I am a bit of a Francophile. This week is week 2 of FFWD and we made the mustard tart. (Week one was gruyere gougerers - which were phenomenal, but I did not have time to take pictures). I won't be posting FFWD recipes here, but I encourage everyone to buy or borrow a copy of this book -- its gorgeous. The mustard tart is a bit like a quiche, but does not have any cheese. The custard is egg and creme fraiche based, with both dijon and stone ground mustard mixed in, along with steamed carrots and leeks. It was very tasty! Although I think a little cheese or perhaps more mustard would have given it the extra tang I was looking for. As my husband said "mmmm mustardy, this needs a bratwurst." This is one more reason my husband has added to to the "why we should get a fry daddy list". I am standing my ground, the dutch oven works perfectly fine for the occasional fry. And now these doughnuts are added to my reasons why we don't need a fry daddy list - I would eat these all the time...these are so good! Like Michael Pollan says, eat at much junk food as you like as long as you make it yourself. In a small stainless-steel bowl set over a pot of gently simmering water, heat the crème fraîche until just warm. Heat the oil to 375°F. Over a large mixing bowl, sift to combine the flour, sugar, baking soda, baking powder, salt, nutmeg; make a large well in the center. Place the yeast in the well; pour the crème fraîche over it. Allow it to soften, about 1 minute. Pour the buttermilk, whole egg, egg yolks, and vanilla extract into the well; whisk together the liquid ingredients. Using one hand, gradually draw in the dry ingredients. The mixture should be fairly smooth before you draw in more flour. Mix until it is completely incorporated and forms a very sticky dough. Wash and dry your hands and dust them with flour. Sift an even layer of flour onto a work surface. Scrape dough out of bowl onto the surface; sift another layer of flour over dough. Working quickly, pat dough into an even 1/2-inch thickness. Dip cutter in flour and, cutting as closely together as possible, cut out the doughnuts and holes. Place holes and doughnuts on a floured surface. Working quickly, gather scraps of dough together, pat into 1/2-inch thickness, and cut out remaining doughnuts and holes. Fry the doughnuts one or two at a time to keep the oil temperature up. It takes about 45 seconds per side. When they are a light golden brown, remove from oil and place on a paper towel lined baking sheet. The doughnut holes take less time and you can fry 4 to 5 at a time. Add the finishing touches of your liking. I made three varieties: sprinkled powdered sugar over doughnuts, pressed the doughnuts into cinnamon sugar mixture, dipped them in a quick frosting made by slowly mixing buttermilk into some powdered sugar until a thick, but thin enough to run off of a spoon, mixture was formed. I picked up some aleppo pepper over the summer at Penzey's. Aleppo pepper is a Syrian spice, similar to paprika, but with a tad more heat and a smoky flavor. Other than topping deviled eggs, I have not found, or really sought out, a recipe to use aleppo pepper. If I stumbled across it in the spice cabinet, I would open the little jar, take a whiff, and put it back. I just couldn't think of anything to do with it that wasn't just a mere substitute for paprika. It is a different more complex flavor than sweet paprika, there has to be a way to use it and highlight its flavor. Well, there is...this recipe cured my aleppo pepper block. I liked it so much, I already have to go back to Penzey's and get a refill. In a small bowl mix together the yogurt, mint and lemon. Salt to taste. Let sit at warm temperature while the chicken is prepared. Prepare barbecue (medium-high heat). Thread chicken pieces and peppers onto metal skewers, dividing equally. Discard marinade in bowl. Sprinkle each skewer with salt, pepper, and additional Aleppo pepper or paprika. Brush grill rack with oil. Grill chicken until golden brown and cooked through, turning skewers occasionally, 10 to 12 minutes total. Transfer skewers to platter. Surround with lemon wedges and serve with warm pita bread and sauce. I recommend trying this recipe if you find aleppo pepper. I used an indoor cast iron stove top grill pan instead of a barbecue -- it's not quite grilling season in Minnesota. I served this with a quinoa-based tabbouleh. This is a really satisfying meal. This is one of my go-to recipes. I do not know where it came from or who gave it to me, but whoever you are thank you. This coffee cake is sure to please. It has made countless appearances on my breakfast table for over 10 years now, and yes I had at one point doctored up a vegan version. The cake is not overly sweet; the oats give it body -- it's a perfect accompaniment for a hot creamy cup of coffee on a lazy morning. I usually make this the day before I plan to eat it, the cake gets more moist and flavorful. Preheat the oven to 375 degrees Fahrenheit. Using a pad of butter, grease the bottom and sides of a 9 inch spring form cake pan. Boil the 1 1/2 cups of water and pour over the oats and let sit for about 5 minutes. Cream the butter and brown sugar in a mixer. Once the butter and sugar are thoroughly combined, mix in eggs and the vanilla. In a separate bowl, sift the dry ingredients together. Slowly mix in the dry ingredients into the butter mixture. Once combined, add in the saturated oats and mix until loosely combined. Pour the batter into the greased pan. For the topping cut the butter with the sugar, flour, and spices. Add in the copped pecans and mix with your fingers until it reaches a crumbly/streusel texture. Sprinkle the topping over the cake. Bake the cake for 30-35 minutes, until a toothpick comes out clean. Winter tomatoes are so tasteless and gummy. Every once and a while I will buy one, hoping for the taste of a ripe summer tomato, almost always ending in disappointment. Instead of waiting five more months for a real tomato, roasted tomatoes are a good compromise. Roasting concentrates the flavor and is the closest I have come to the taste of summer tomato in the depths of winter. This is a relatively quick yeast bread. I would recommend making for a Sunday brunch. Preheat the oven to 300 degrees F. Divide the tomatoes evenly between two rimmed baking sheets. Drizzle with 1/4 cup of olive oil, and sprinkle with 2 teaspoons of salt. Bake until tomatoes begin to shrivel and the juice on the pan has reduced, about 45 minutes; remove from oven. Lightly brush a 17 by 12 inch rimmed baking pan with oil and set aside. Raise oven temperature to 425 degrees F.
In a medium saucepan over low heat, bring milk to a simmer. In a bowl of an electric mixer, combine 2 teaspoons of salt, flours, 3 tablespoons olive oil and yeast. Mix on low speed, gradually pouring in the hot milk until combined. Once combined mix on medium speed for one minute. The dough will be very sticky. Transfer to prepared baking sheet. Using lightly oiled hands, spread dough evenly, making sure it fills the pan. Cover tightly with oiled plastic wrap and let rise in a warm place for 30 minutes. Using fingers, dimple the dough unevenly, leaving 2 inched between dimples. Arrange half of the tomatoes on the dough. Drizzle with 1/4 cup of olive oil, sprinkle with salt. Bake rotating sheet halfway through until golden brown, about 20 minutes. Remove from oven, drizzle with 1/4 cup olive oil, cool on wire rack. Add remaining tomatoes and sprinkle with salt. Slice with serrated knife and serve. Bread can be kept for 2 to 3 days tightly wrapped in plastic wrap at room temperature.